Look at that picture. Look at it. I wish I could draw pictures like that. While I fool around on this blog, my younger brother sketches fantastic pictures in pencil and posts them on his DeviantArt page. Seriously, I don’t know how he produces drawings like these. I’m guessing pencils and paper are involved somehow; the rest is a glorious mystery. 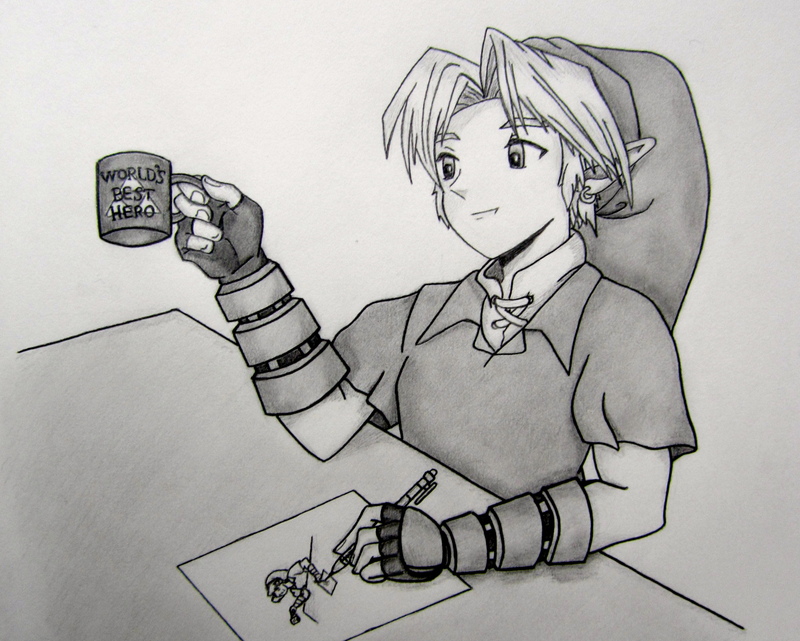 The image above is my brother’s profile picture: Link, the protagonist of the Legend of Zelda games, drinking coffee and drawing… himself. (If his coffee cup is to be believed, Link is also the World’s Best Hero.) As a Zelda fan, I find my bro’s profile picture clever and hilarious. I strongly recommend taking a look around my brother’s DeviantArt profile. Seriously, it’s cool. Check it out! This post was originally published on November 27, 2013. TMTF shall return with new content on February 22, 2016! This entry was posted in Geeky Wednesdays and tagged cool artwork, Legend of Zelda by Adam Stück. Bookmark the permalink.